A brief, bright streak of orange pierced the cool, clear sky before burning into another day filled with possibility, hope and uncertainty as a group of high school seniors gathered at Central Texas College gazing to the east. 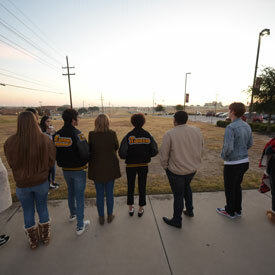 In front of the CTC Anderson Campus Center at dawn Wednesday, the first-ever graduating class of the Killeen ISD Early College High School met for a senior sunrise breakfast ceremony. First, a few students huddled together, some with blankets and hot drinks. Then, a few more came. Eventually, about 25 or so looked to the lightening eastern sky. About 90 seniors gathered inside the campus center for breakfast and received class rings and CTC pins. A pair of student leaders spoke to their classmates, pointing out that their time together as students, burning brightly, will soon pass into graduation and adulthood. 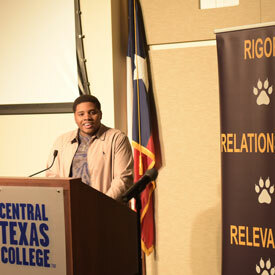 The Killeen ISD ECHS, in partnership with CTC and Texas A&M University-Central Texas, is in the middle of its fourth year. Students are scheduled to earn their high school diploma and associate’s degree concurrently. 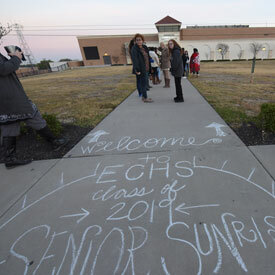 “The senior sunrise represents us moving on to adulthood,” said Early College senior Satchel Bellard, the school’s student council president. In his remarks to his classmates Wednesday, he referred to a verse in the Old Testament book of Jeremiah, “fresh as the morning and sure as the sun rises,” noting the class’ journey to near completion. Principal Kathleen Burke pointed out that the Early College students have always made their own decisions, building new traditions, declaring their own mascot, starting their own clubs and often stating their own opinions. Following the sunrise and the motivational remarks from their principal and student leaders, each student stated their name and intended post-secondary education plans and received their class rings and CTC pins. In the spring, the seniors plan to host a sunset ceremony to mark the end of high school. They will participate in the CTC graduation May 10 and the first-ever ECHS graduation May 31.